While fifteen-year-old Ariane Forsythe's life is definitely soaked in the reality of a mother who disappeared from a psych ward, an aunt battling cancer, and the torment of mean girls Shania McHenry and Felicia Knight at her new school, Edward Willet has bathed Song of the Sword in an ethereal quality that may or may not allow Ariane to ride out her burdens. Readers will certainly hope she can, though I'm not too sure Ariane has the imagination to believe this, yet. Ariane realizes that she may be able to find her mother. Although he knows that it will infuriate his sister, Wally insists on helping Ariane, as the Lady recommends. Crushing on Ariane probably has something to do with it too. Enjoying having someone with whom to share, Ariane is pleased that Wally becomes a fast friend and the two work together to learn more about Merlin. After being followed repeatedly by a man in a Ford Focus decaled with an ECS logo and some scary computer activity, they suspect that Merlin is the incredibly wealthy Rex Major, the head of Excalibur Computer Systems. And when Rex Major is reported to be heading to the Northwest Territories to check out a diamond mine, Ariane is sure that the first shard of Excalibur will be found there. Learning how to use the Lady's water magic and about some family secrets, Ariane and Wally accept the challenge to get to the Northwest Territories and recover that shard before Rex Major does. Because Edward Willett ensures that there is a lot of action in Song of the Sword as well as emotional issues of family and trust, it's a fantasy that will grip teens of both genders. I'll bet that Ariane's travels by water magic–moving between any interconnected conduits and sources of fresh water–will provide some intriguing imagery, and quite a few laughs, especially when she has Wally in tow. 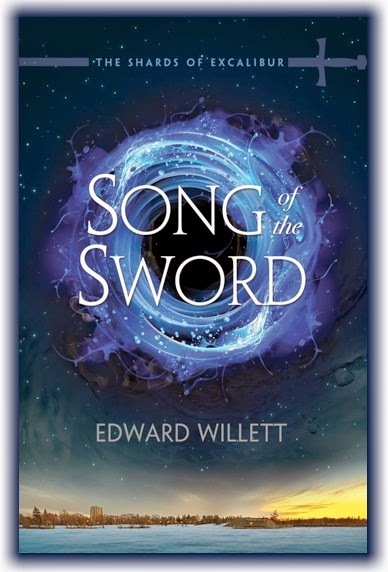 And Edward Willett blends the humour with the ethereal fantasy of Song of the Sword so easily. As Ariane realizes, it can all seem so silly (life, that is, not the story). Readers will be right in there, cheering for Ariane and Wally, worried with every obstacle that jumps into their path, hopeful that the bad guy won't prevail. 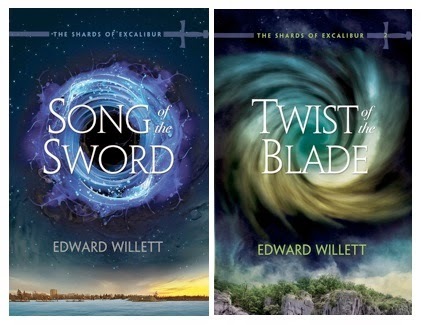 Luckily, Edward Willet has only just begun The Shards of Excalibur series. There are five books set for the series, with Book 2, Twist of the Blade, set for release in September. If you're fortunate to be in Regina, the setting for the series, on September 25, 2014 (7 p.m.), consider attending the book launch for the series and Twist of the Blade at the Assiniboia Gallery on Smith Street. And I'll get onto Twist of the Blade as soon as I can to share whether the two major ripples at the end of Song of the Sword become typhoons, heaving against and between our young heroes. Let's hope not.